Home / $GBP / Post-Brexit / Is Carney the Sole Adult in UK's Political Morass? 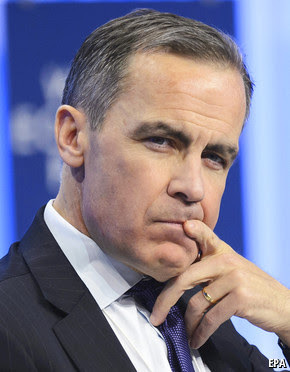 Is Carney the Sole Adult in UK's Political Morass? Sterling is continuing to move lower. It has tested the $1.3050 area in the North American morning, having been under pressure through the Asian session and the European morning. That the UK economy is slowing down, materially, as BOE Governor Carney said, is not really new news. Nor is the fact that the BOE reversed its previous decision to force banks to boost their capital buffers. This was anticipated last week. The news today that has unhinged the market was that now two real estate funds have moved to suspect trading (and withdrawals). As the contagion grows, there may be some important implications for how central banks think about systemically important financial institutions and whether the world's largest asset managers could be included in the regulatory web. While we anticipated a political crisis if the UK voted to leave the EU, but it seems more profound. It has become clear that the Leave advocates are as surprised and ill-prepared as nearly everyone. Cameron's resignation was not surprise, but Johnson's withdrawal was. His Brutus, Gove, is also apparently doing miserably in the leadership contest, even if he survives the today's first cut. The Labour Party is hardly in a position to capitalize on the Tory's woes. While the UK Tory MPs are voting on Cameron successor, Labour MPs have made it clear in last week's vote; Corbyn does not have their support. It is not clear that he ever did. However, the feckless campaign to remain, coupled with the poor showing in the early May local elections, is splitting the party. The head of UKIP has been kept at an arms length by the Tories and has also stepped down. While the political class is in disarray, BOE Governor Carney has emerged as the "adult in the room." He has now presented publicly three times since the referendum and is message is consistent. The decision to leave the EU had a headwind before the actual vote, and the disruptive impact is likely to be serious. There is scope for a monetary response, but neither the price nor the quantity of money can be manipulated to solve the UK's self-induced challenges. As we have noted before, it may appear that UK equities are faring alright. The FTSE 100 is higher on the day and is almost 5% since the day before the referendum. However, the FTSE 100's performance is not really about the UK economy, but about the foreign earnings that they earn are worth so much more in sterling, which is how the corporate performance is measured. A better gauge of the UK economy is the FTSE 250 is off almost 8% over the same period. The FTSE bank share index is off 10%. Cameron had initially suggested that a Brexit vote would nearly immediately trigger Article 50 of the Lisbon Treaty that governs the exit. Then he changed his mind, deferring the decision to his replacement. It want anticipated that Cameron's successor would not be selected until October. That was moved up until early September. However, several of the candidates have indicated no intention on triggering the divorce until next year. Now the plot has thickened again. There is a constitutional issue of the role of parliament in invoking Article 50. A private firm opined that a vote in Parliament is necessary. According to some reckoning before the referendum, a majority of MPs were opposed to Brexit. However, the government's lawyers have argued that decision sits with the Prime Minister. Many would have assumed these issues would have been worked out before the referendum. The Bank of England seems to be among the only centers of power in the UK that had a game plan. The $1.30 level for sterling has psychological importance. A break would spur calls for $1.25 on the way to $1.20. Sterling depreciation feeds through into inflation considerable faster than it will boost the competitiveness of UK manufacturing exports.